There are many SUVs in BMW’s lineup, but there was still one missing. Until now. In order to compete with the Mercedes-Benz GLS, the Range Rover, the Lexus LX and the Infiniti QX80, BMW just launched the much-anticipated X7, a full-size SUV that will go on sale this month. It will also measure up to the mammoth Cadillac Escalade and Lincoln Navigator, which are both the biggest vehicles in this category—especially in long-wheelbase format. Would BMW be tempted to build an even-bigger X9? We seriously doubt it, because quite frankly, the X7 is big enough. 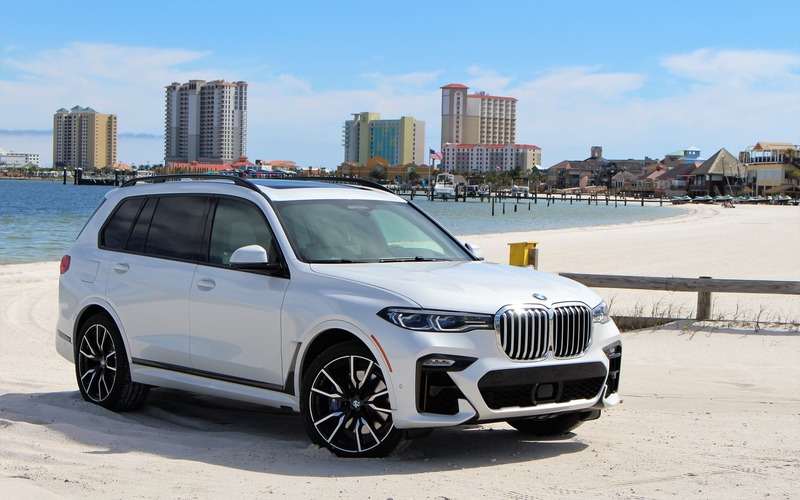 The redesigned 2019 BMW X5 and the X7 are built on similar platforms, but company representatives pointed out that once the base architecture was laid out, the two vehicles’ platforms were developed separately. The X7’s wheelbase is longer by 130 millimetres and overall length is 229 mm beyond the X5’s. Width is about the same, but the X7’s roofline is about 50 mm higher. The GLS, arguably the X7’s main competitor, is about the same size. The 2019 BMW X7 comes in two flavours for the time being. The xDrive40i is equipped with a turbocharged, 3.0-litre inline-six that develops 335 horsepower as well as 330 pound-feet of torque from 1,500 to 5,200 rpm. It’s connected to an eight-speed automatic transmission and—of course—all-wheel drive. The xDrive50i benefits from a twin-turbo, 4.4-litre V8 that produces 456 horsepower as well as 479 pound-feet of torque from 1,500 to 4,750 rpm. According to BMW, it can blast from 0 to 100 km/h in 5.4 seconds, while the xDrive40i can achieve the same feat in 6.1 seconds. Both engines are smooth and powerful, and identical to those offered in the new X5. The turbo six is likely the most popular choice in the latter, but could more X7 buyers be attracted by the V8 instead? A few thousand bucks more doesn’t make a huge dent in the monthly payments. Note that when properly equipped, both can tow up to 7,500 pounds (3,402 kilograms). To showcase the 2018 BMW X7’s talents, the automaker organized a cross-country drive from Spartanburg, South Carolina—where the SUV is built—to Palm Springs, California. Canadian journalists were invited to attend the fourth leg of the trip, from Tallahassee in Florida to Baton Rouge in Louisiana. In one day, we drove about 750 kilometres, crossing the southern tip of the states of Alabama and Mississippi in one afternoon. With the six-cylinder X7, we averaged about 9.0 L/100 km. Is the X7 a comfortable highway tripper? Hell, yeah. And aside from a little wind noise, its cabin is quiet, too. But so are pretty much all of its competitors. In Comfort mode, the BMW’s ride is soft, with longer suspension rebounds to soak up road imperfections as much as possible. In Sport mode, the dampers are firmed up to make the X7 feel more dynamic, in tune with the company’s sporty driving philosophy. It can’t hide the vehicle’s 2.5-tonne mass, but it feels like a BMW should. What about an M Performance edition? Not in the plans, at least for now. The X7 is equipped with three rows of seats as standard, and in the middle row, buyers can swap the three-row bench for two individual chairs—obviously reducing seating capacity from seven to six. That third row offers enough space for road trips, if occupants aren’t too tall. 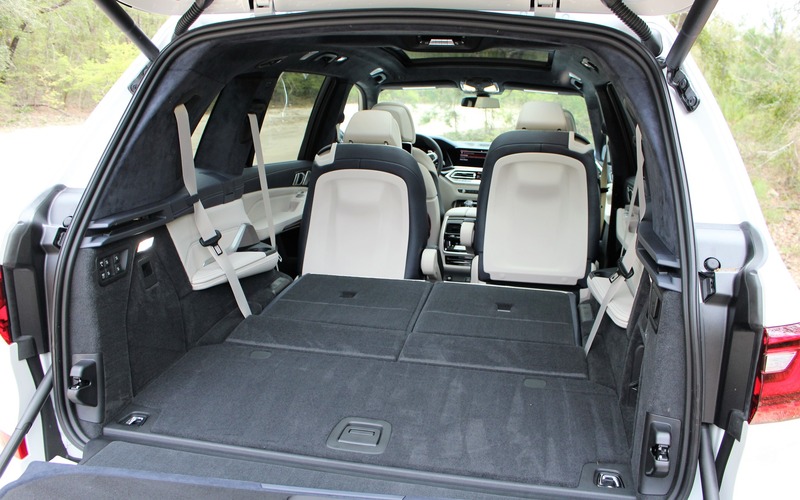 The X5 offers room for five people, or seven with the optional third-row seat. By the way, skip the optional running boards, which are useless aside from dirtying our pant legs. In the cargo area, there are buttons to electrically fold down or up the third-row seatbacks and move the second row frontwards. Maximum loading capacity is set at 2,120 litres, and when all the seats are occupied, there’s about 300 litres left for a couple of bags—more or less what similar-sized competitors offer. The 2019 BMW X7 is claimed to be the SUV equivalent of the 7 Series sedan, meaning it’s the most luxurious utility vehicle in its lineup. In reality, it looks more like an upscale version of the X5. The perforated Vernasca leather and BMW Individual Extended Merino leather are available in both, and in various colours as well. Features like ventilated and massaging front seats, heated second-row seats, a rear entertainment system, a panoramic sunroof, a wide choice of 22-inch alloy wheels, various wood trim choices and a Bowers & Wilkins Diamond Surround Sound System are offered in both, too. 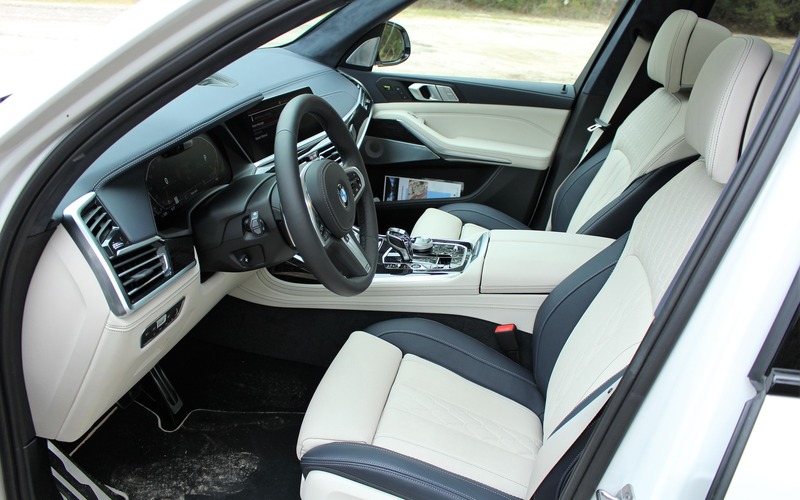 The X7’s cabin can be dressed up with two-tone seat upholstery, the X5 cannot. Also available is a Dynamic Handling Package that can be added to the 7 Series sedan as well, which includes Integral Active Steering (read: rear-wheel steering), an M Sport differential and Active Comfort Ride with Road Preview. The latter uses the vehicle’s navigation system to adjust the adaptive suspension and shift gears according to road conditions ahead, such as a tight bend or a hill. It’s big, it’s sophisticated and it’s oh-so-refined. The 2019 BMW X7 may have a hard time justifying its existence alongside the X5, given its much higher price. Then again, for showing neighbours that we’re standing at the top of the society ladder, owning the biggest model of a brand is enough for some people. The xDrive40i starts at $92,500 before freight and delivery charges, while the xDrive50i is listed from $110,100. However, aside from the bargain QX80, the X7 is competitively priced compared to its segment rivals and is—unsurprisingly—the sportiest choice amongst full-size SUVs. 8/10	Not bad at all with the six-cylinder engine. At least on the highway. 9/10	The Comfort mode really softens up the suspension, and with optional massaging seats, the X7 is a fantastic road tripper. 8/10	The 3.0-litre six will do the job just fine. The V8’s extra power and sound are addictive, but it comes at a price. 8/10	Despite being loaded with features and menus, BMW’s system is easy to use while driving, thanks to the iDrive controller. 8/10	For a big SUV, the X7 can be quite dynamic. It’s a BMW after all. 8/10	Whatever we’d need a full-size luxury SUV for, the X7 delivers.